Hello there folks! Jerm here with another cool update for ya! 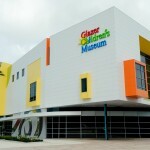 Tampa Bay residents and visitors alike are in for some good fun on December 21 when clowns from Ringling Bros. and Barnum & Bailey®, will charge kids fitness funny bones at the Glazer Children’s Museum with their CircusFit program! CircusFit, a new national youth fitness program developed by Ringling Bros. in partnership with The President’s Council of Physical Fitness and Sports, encourages America’s youth to lead healthy, active lifestyles by combining the fun of unique circus skills with stretching, strength building and aerobic exercise. Participants can try a variety of circus skills like stretching, juggling, and balancing arts. Each child will also receive a certificate of completion, discount coupons for the circus and their very own clown nose. CircusFit Seminars will be held at 11:00 a.m., 12:30 p.m., 2:00 p.m. and 3:30 p.m.
Just when you thought it couldn&apos;t get more awesome, all visitors to the Glazer Children’s Museum on December 21 can also register to win a rare and unique pachyderm painting (created by one of the shows electrifying elephants) and tickets to this year’s all new show, Fully ChargedSM!